Melissa O'Shields and Laurence Bridges teamed up together in 1989 to design and produce woodcarvings under the name Melissa * Laurence Artisans and began selling their works on the art show circuit throughout the eastern United States in 1990. Melissa and Laurence have announced that they will be retiring in 2007 and will no longer be carving or comissioning their art. Laurence studied commercial art and design at Perry International in Atlanta, GA from 1967-1969. And commercial art, oriental art, and design at Etsura Hayakawa in Sizouka Ken, Japan from 1971-1973. He fell in love with the Orient and began traveling and studying art throughout southeast Asia. In Sri Lanka he studied the ancient methods of Batik dyeing, but it was in Madras, India where he became fascinated with woodcarving and ancient methods of antiquing. He found a master carver who offered him an apprenticeship and he lived and studied in India for 1 1/2 years. Melissa studied photography with one of Ansel Adams students, Neil Chaput, at Callanwolde Fine Arts Center in Atlanta, 1974-1976. She had an award-winning photograph published in Redbook Magazine in 1975. She began a ten year career in real estate in 1978 which led her to home design and restoration and ultimately her love of finishing wood. 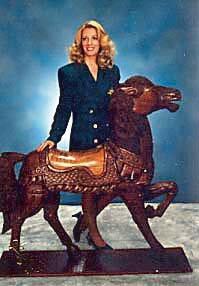 In 1989 under Laurence's direction she began studying woodcarving and found a master carver in Thailand to apprenticeship with. "The horse is a focal point for everyone that enters the house and it is truly a work of art, I will treasure it forever." 2001 HGTV (Home & Garden Television) "Our Place"
March 1999 - Guest appearance on WSB TV "People to People"